Fall River Village would be a great headquarters for your next family reunion in Estes Park. We are situated along Fall River's Riverwalk and two blocks from downtown Estes Park. Each family can have their own condo, but everyone can gather together in one of our meeting places to talk, eat or play! No need to coordinate driving - walk or take the free shuttle downtown or to Rocky Mountain National Park. Guests can choose from our condos with three different floor plans or our larger town homes. We also have options for riverside, poolside, or mountainside lodging. 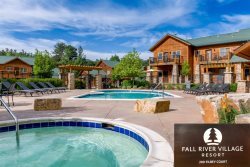 Most of the condos offer magnificent mountain views of the Continental Divide, Longs Peak, Lumpy Ridge, or Old Man Mountain and all of the riverside condos overlook Fall River. 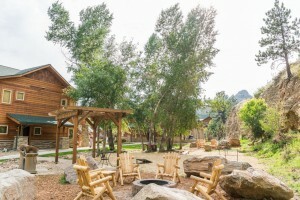 So, you really can make your family reunion in Estes Park all your own! Call us to discuss details. Otherwise, your family members can start booking now! We require 35% of the room rate and tax to be paid at the time of booking, 31 days or more in advance. Within 30 days of arrival, the whole balance is due. A reservation can be fully refunded less an $89 fee with written notice 31 or more days prior to arrival. Our ground level condos have a cement patio, while our upper level condos offer a balcony. You can gather as a larger group on adjoining patios if you choose neighboring ground level condos, or you can use the community deck on the upper level condos. We have a 750 sq ft community room available for use; rental price is $150 per hour, max of 5 hours per day. It accommodates about 35 people and features a stainless steel fridge/freezer, two smart HD TVs and a handicap accessible bathroom. You can rent this space for additional time based on availability. We also have an outside recreational space that has fire pits, grills, a hammock, yard games, and a picnic table to gather at. This area is used on a first come, first served basis.